LEARN TO FEEL… Empowered, positive, focused, rooted and calm. Kids class from 7:30 to 8:15 pm. 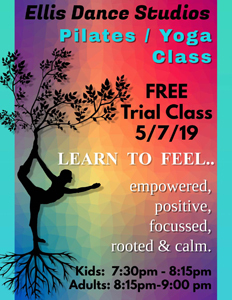 Adults class from 8:15 to 9:00 pm. 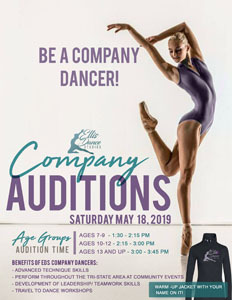 Be a Company Dancer! Auditions will be set by are range, from 1:30 pm to 3:45 pm. Please download flyer for time slots and additional information. 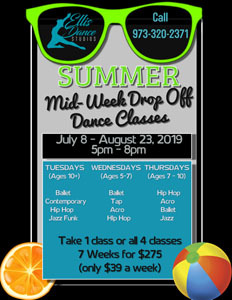 Not just any Summer Camp… It’s Dance! 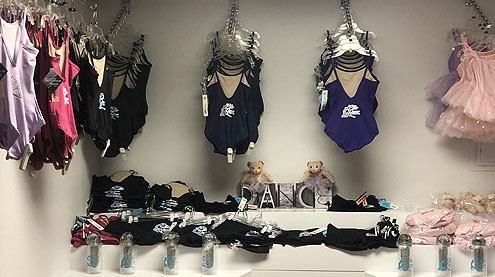 Ballet, Hip Hop, Acro, Tap, Jazz and more! 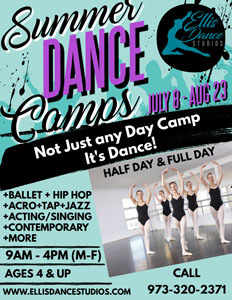 Our Summer Dance Camps will be running from 9:00 am to 4:00 pm. Available on Tuesdays, Wednesdays and Thursdays. The program will run from 5:00 pm to 8:00 pm. Please call us at 973.320.2371 or stop by the Studio for more information.